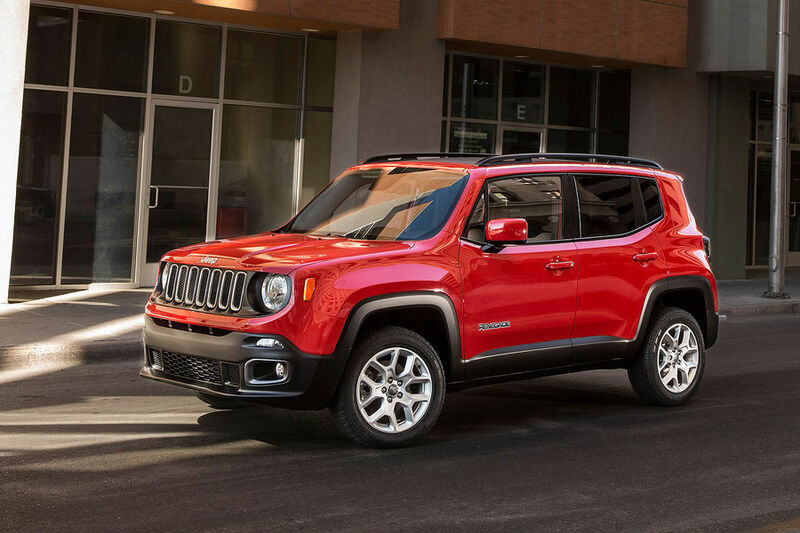 American SUV maker Jeep has unveiled new versions of the Renegade small SUV at the 2016 Los Angeles Motor Show, which are the Deserthawk and the Altitude. Both are limited edition models and ready to go on sale soon. The Jeep renegade Deserthawk is based on the Trailhawk 4×4. 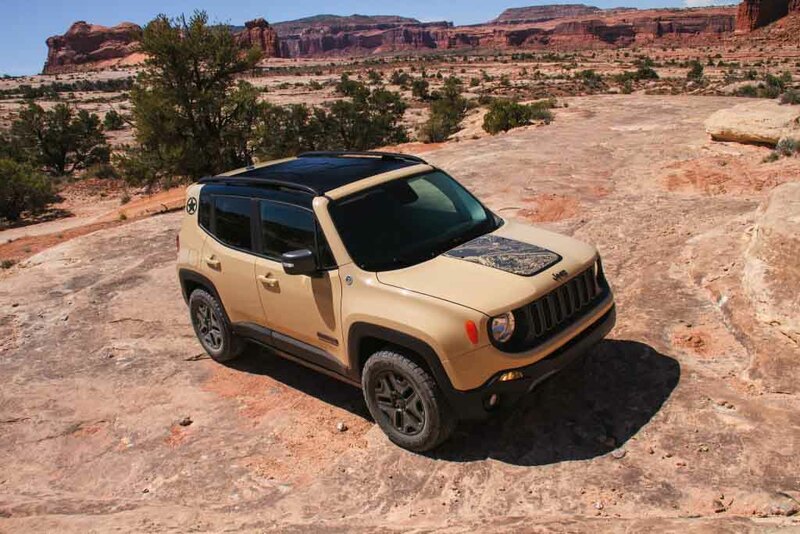 The Renegade Deserthawk has been designed to portray a rugged and off-road worthy image. This SUV is painted in ‘Majove Sand’ exterior colour and it dons exclusive styling details. To make the car appealing to the off-roading enthusiasts, Jeep has equipped it with all the off-roading features found in the Trailhawk. It gets Jeep Active Drive Low 4WD system, Selec-Terrain system, underbody skid plating etc. Also read: Jeep Renegade Stoppie Video Can Amaze You! Apart from the Mojave Sand exterior paint, the SUV is also available in three other colour options as well, which are the Alpine White, Anvil and Black. The SUV sports vertically slated aggressive front grille painted in Black, round headlamps, blackened muscular bumper, large air intake, Red painted tow hooks. The hood gets a topographical map of Moab, Utah. This surely gives the car a more attractive appearance. The SUV runs on 17-inch Black wheels wrapped in thick Goodyear Wrangler SR-A tyres, while the roof and roof rails are completely blackened. The D pillar sports a black star, which used to found on the World War II era US military vehicles. 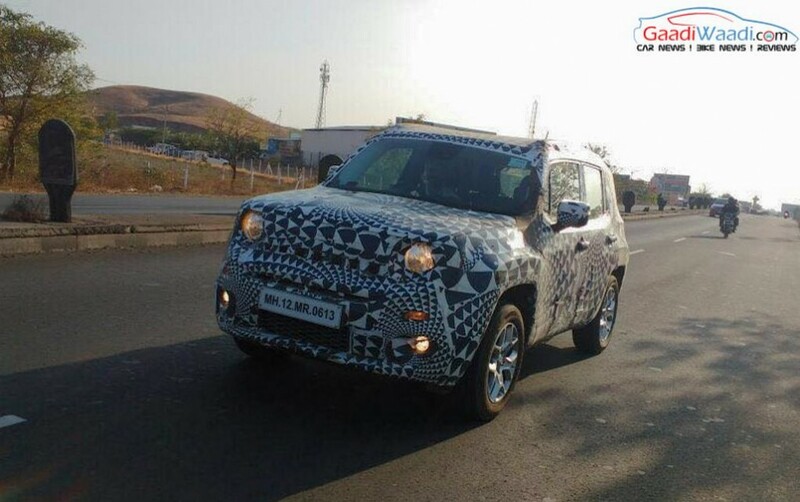 This hints to the Jeep’s rich heritage, while the rear fascia gets Red painted tow hooks and unique graphics. Inside the cabin, the Jeep Renegade Deserthawk features exclusive Black leather seats, Light Frost stitching and accents, all-weather floor mats and cargo tray mat. Power source for this limited edition SUV is Jeep’s 2.4-litre Tigershark four-cylinder engine, which is capable to produce 180 hp of peak power and 237 Nm of peak torque. The Renegade Deserthawk is expected to go on sale from January 2017 and it could get a price tag of $28,140 (Rs. 19.15 lakh).